CASE FOR EXCELLENCE Whenever the new gear from First Tactical arrives at our warehouse, it feels like Christmas. We get very excited each time we open the boxes, and the company has never failed to impress. This too was the case with First Tactical Rifle Sleeves. Carefully designed as a lightweight weapon carriers for professional shooters and tactical operators, First Tactical Rifle Sleeves come in three sizes (36″, 42″ and 50″) and three colour options: Black, Coyote and OD Green. With an overall capacity ranging from 9.8 litres (600 cu.in.) for the 36″ version, to 13.5 litres (820 cu.in.) for the 50″ one, depending on the model they can hold a single rifle of up to 50″. The exterior is made of robust and weather resistant 500D Nylon, and come with a discreet First Tacticalbranding and three rows of Hook and Loop organisation platform for attaching IDs and morale patches. Placed on top, are two low-profile carry handles, additionally reinforced and padded for extra safety and comfort. 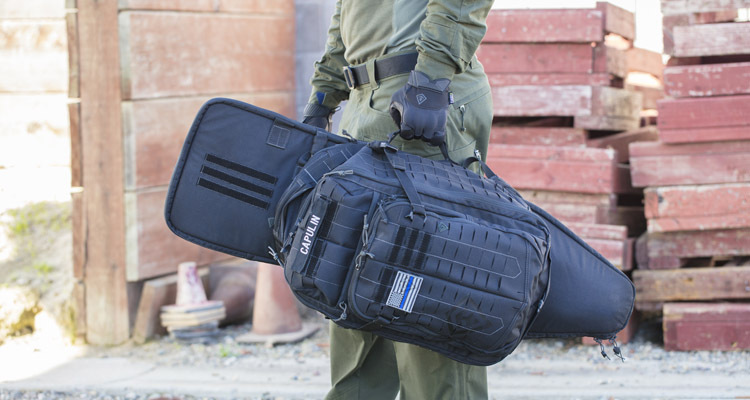 Furthermore, a robust attachment point was added on each end of the case for use as a sniper drag bag. There are also two silent-locking and quick-release compression straps for volume adjustments when carrying a light rifle load. First Tactical Rifle Sleeves feature lockable two-way main YKK zipper on the main compartment which is very smooth and comes with glove-friendly zipper pulls. Inside, there is a heavy-duty lining made of 300D Nylon and a 10mm closed cell foam for padding. Up at the top – a soft Hook and Loop field for optional attachments, and name/number tag on the opposite side for easy identification. Provided are two rows of integrated MOLLE webbing with adjustable and padded rifle retention strap to hold the gun without movement. There is also a clever compression moulded barrel mount that holds the muzzle at the very bottom offering even better fit and excellent steadiness. This barrel mount is removable and repositionable and works perfectly as an extra safety feature. It’s also worth adding that these sleek, slim and easy to carry gun bags come with durable Duraflex hardware. Moreover, each and single First Tactical Rifle Sleeve comes with First Tactical’s Thru System hanging hooks placed on the backside, making them fully compatible with compartments in all First Tactical backpacks. So you can easily pair your sleeve with First Tactical Tactix 1-Day Plus or Specialist Half-Day Backpacks for confident and reliable firearm transportation whenever you need it.